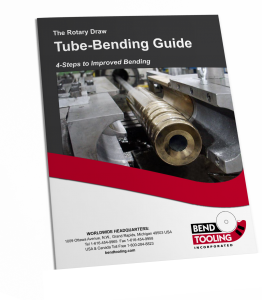 The threading of clamp die and clamp insert cavities to improve the grip of those tools on the tube. The drawback of serrations is that they can mark, and even cut into, the outside surface of the tube. Serrations of a fine pitch will reduce marking, but have less of a grip. Moreover, their grooves more readily fill with dirt, oil, and other debris of the bending process, further reducing their effectiveness if not cleaned regularly. Nevertheless, if the part does not require an unmarked surface, serrations are an effective solution for applications demanding clamps as short as one times the tube diameter.